The barnacle goose was first classified taxonomically by Johann Matthäus Bechstein in 1803. Branta is a Latinised form of Old Norse Brandgás, "burnt (black) goose and the specific epithet is from the Ancient Greek leukos "white", and opsis "faced". 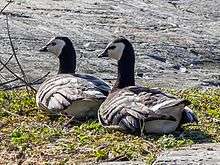 The barnacle goose and the similar brant goose were previously considered one species, formerly believed to be essentially the same creature as the barnacle. 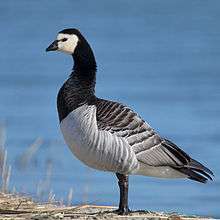 This gave rise to the English name of the barnacle goose and the scientific name of the brant. It is sometimes claimed that the word comes from a Celtic word for "limpet", but the sense-history seems to go in the opposite direction. The barnacle myth can be dated back to at least the 12th century. Gerald of Wales claimed to have seen these birds hanging down from pieces of timber, William Turner accepted the theory, and John Gerard claimed to have seen the birds emerging from their shells. The legend persisted until the end of the 18th century. In County Kerry, until relatively recently, Catholics could eat this bird on a Friday because it counted as fish. In Judaism birds that grow on trees are not kosher. The barnacle goose is a medium-sized goose, 55–70 cm (22–28 in) long, with a wingspan of 130–145 cm (51–57 in) and a body mass of 1.21–2.23 kg (2.7–4.9 lb). It has a white face and black head, neck, and upper breast. Its belly is white. The wings and its back are silver-gray with black-and-white bars that look like they are shining when the light reflects on it. During flight a V-shaped white rump patch and the silver-gray underwing linings are visible. The barnacle goose is one of the species to which the Agreement on the Conservation of African-Eurasian Migratory Waterbirds (AEWA) applies. According to Sveriges ornitologiska förening the geese began breeding in Sweden in 1971, and according to Skansen it was 40 years ago, more or less, when the entire population of barnacle geese left in the autumn to return in spring, soon after they began breeding in the wild. 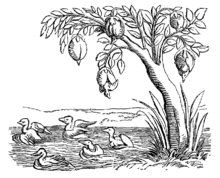 The question of the nature of barnacle geese also came up as a matter of Jewish dietary law in the Halakha, and Rabbeinu Tam (1100–71) determined that they were kosher (even if born of trees) and should be slaughtered following the normal prescriptions for birds. ↑ BirdLife International (2012). "Branta leucopsis". IUCN Red List of Threatened Species. Version 2013.2. International Union for Conservation of Nature. Retrieved 26 November 2013. 1 2 Jobling, James A (2010). The Helm Dictionary of Scientific Bird Names. London: Christopher Helm. pp. 77, 225. ISBN 978-1-4081-2501-4. ↑ Soothill, Eric; Whitehead, Peter (1978). Wildfowl of the World. London: Peerage Books. ISBN 0-907408-38-9. ↑ Ekin, U. (2011). "Branta leucopsis barnacle goose". Animal Diversity Web. University of Michigan Museum of Zoology. Retrieved 8 January 2015. ↑ "Waterbird species to which the Agreement applies". UNEP/AEWA (United Nations Environment Programme/African-Eurasian Waterbird Agreement). Retrieved 8 January 2015. ↑ Lankester, Edwin Ray (1970) . Diversions of a Naturalist. p. 119. ISBN 0-8369-1471-6.